We continue our popular and successful series devoted to the biggest chart records of each calendar year in the early chart era as we focus on 1941, the first full year of the Billboard Best Sellers chart – the chart was launched in July 1940. This great value 91-track 4-CD set comprises every record which appeared in the Best Sellers Top 10 during the year, which was the first complete calendar year of the sales chart. The big names of the swing era were very much in evidence, and the year started with Artie Shaw’s “Frenesi” at No. 1 and finished with Glenn Miller’s “Chattanooga Choo Choo” occupying the top spot. In between, a host of other big names made their presence felt - Jimmy Dorsey, Tommy Dorsey, Bing Crosby, Dinah Shore and others - alongside many highly collectable lesser-known records by some artists we don’t hear too much about these days. It makes for an intriguing and very entertaining musical snapshot of a year when the USA was enjoying the calm before the storm of Pearl Harbour in December of that year. It includes a 10,000 word booklet with a commentary on every record as well as full discographical and chart information. 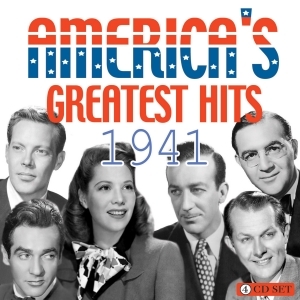 5 Only Forever Bing Crosby with John Scott Trotter & His Orch. 10 Ferry-Boat Serenade Andrews Sisters with Vic Schoen & His Orch. 11 There I Go Vaughn Monroe & His Orch. 21 I'll Be With You In Apple Blossom Time Andrews Sisters with Vic Schoen & His Orch. 23 'Til Reveille Bing Crosby with John Scott Trotter & His Orch. 4 You And I Bing Crosby with John Scott Trotter & His Orch. 9 Jim Dinah Shore with Paul Wetstein Orch.